Program Director, John Mocko, at 336-596-4517. The Lifeline Fund addresses economic challenges of rostered ministers in the NC Synod. Grants from this fund are awarded for a variety of needs such as: unmet medical expenses, lingering seminary debt, funds for unexpected emergencies, and more. Our goal is to raise $125,000 each year for the next three years to add to the seed money initially given by Lilly Endowment. Beginning in 2019, new, increased grant amounts are available. Learn about the updates and apply today! 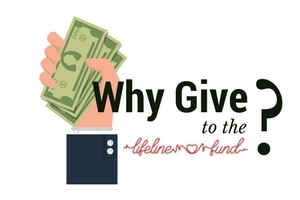 Why give to the Lifeline Fund? A pastor serves in ministry for 55 years, yet in retirement, finds himself broke and in a nursing home. As his health fails, at age 82, he and his wife are unable to pay his medical bills. They have to declare bankruptcy. They lose their home. He is now in a nursing home on Medicaid and his wife lives in low-income housing. A truly heart breaking story! The Lifeline Fund and Bishop Smith got together and presented this pastor and his wife with $3,000 to pay off his outstanding medical bills! A young clergy couple graduated from seminary, bringing with them over $40,000 in debt. As a clergy couple, they received their first call and now are serving in a congregation they love and which loves them. Their call is part time, so together they make what a single pastor would make and yet they still have their seminary debt to repay. The Lifeline Fund has awarded each of them $1,200, paid to their lender. This is our effort to help pay down their seminary debt, take them on a path to financial well-being through financial education and counseling, and keep them stress free as they journey in ministry. Give to the Lifeline Fund today!